Curated list for an enchanting travel experience..
Ooty, the Queen of Hill stations, welcome you with mesmerising meadows, soothing environment, cool weather and a wide array of sightseeing places to visit and admire. Each tourist attraction in Ooty promises a unique and lively experience that will leave you in awe for many days to come. However, if you are wondering what to do in Ooty and what to see in Ooty then have a look at the various sightseeing places that we have mentioned below. With these interesting places to see, you can be sure of having a memorable Ooty tour. Located 28 km away from Ooty, Avalanche lake is a must visit when on Ooty Tour. This lake, beautifully lying amid the lush greenery of mountains and landscapes mesmerises every visitor. It was created due to a massive landslide somewhere around 1800s hence the name. It is popular for trout fishing and the required equipment for it can be taken from Trout hatchery. Along with exploring the surrounding areas and its rare flora and fauna, other activities that are popular here are camping, rafting and trekking to nearby hilly regions such as Upper Bhavani. It is also an ideal picnic spot. 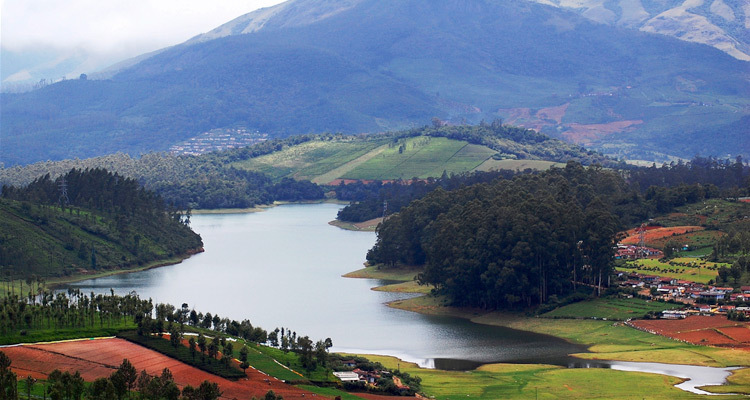 One of the most important parts of every Ooty tour, Ooty lake is indeed a place to visit. nIt is an artificial lake that was built for fishing purposes. This lake is popular for boating. Tourists can be seen enjoying a refreshing ride on its serene waters. There is boating house located near the lake offering a wide array of boats on hire. Cycling by the side of lake is also worth experiencing. There are also a few shops located around the lake, selling various locally made items. Located near the Emerald Village in the Nilgiri District, Emerald Lake lies in a place called as SIlent Valley. It is situated around 25 km away from Ooty. A beautiful lake offering an ideal place for picnic where you can relax and spend some quality time with your loved one. Tea plantation surrounding add on to the overall beauty of the lake. The view of sunrise and sunset from here is breathtaking and not to be missed. Maintained by the Horticultural Department of Tamil Nadu, Botanical Gardens of Ooty is undeniably one of the most popular places to see in Ooty. Spread over 55 acres of land, this garden is divided into five different sections such as Fern House, Lower Garden, Italian Garden, Conservatory and Nurseries. The flower show conducted here as a part of Ooty Summer festival is a major attraction. Another popular attraction of Botanical Garden is the Fossil Tree Trunk that is said to be around 20 million years old. The wide variety of plants here are worth exploring. Located at a distance of 2 km from Ooty Lake, Deer Park is easily accessible by road. With its rich fauna along with varieties of deer such as Sambhar and the Chithal, Deer park makes up for an interesting visit, especially for wildlife enthusiasts. Equally rich is the variety of flora in this park. Spread across an area of 22 acres, this park was established in the year of 1986. It is one of the known wildlife sanctuaries of not only Tamil Nadu but of India presenting amazing opportunity to observe the wildlife and various animals from closer. Located at an altitude of 2623 meters, Doddabetta Peak is the highest peak in the Nilgiris. At the junction of Western and Eastern Ghats, it is around 10 km away from Ooty. Covered by dense sholas, this peak is trekkers favourite point. The view fro the top of the peak is absolutely mesmerising, there is a telescope house at the peak with two telescopes presenting captivating view of the valley around. Rich flora and fauna here add on to the overall charm of Doddabetta Peak. About 13 km away from Ooty, on the Ooty-Mysore Road, Kalhatty Waterfalls is one of the most beautiful waterfalls that you will see on an Ooty Tour. This waterfall can be reached via a trek of 2 mile from Kalahatti village. It is believed that great Hindu saint Agastya has once lived here. With its rich avian fauna, it is often visited by bird watchers as well. Its scenic beauty is sure to leave you spellbound. A popular place for picnics and film shooting, this dam is situated around 10 km from Ooty bus stand. Also known with the name of Sandynallah Reservoir, this dam offer peaceful environment with beautiful surrounding where tourists can spend some time at ease. Along with being a popular picnic spot, it is also visited by tourists for bird watching as well as for fishing. It is a popular site for researchers who come to study environment. Connecting Eastern Ghats and the Western Ghats, on the Ooty Mysore route, Mudumalai National Park is another place to visit by Nature lovers when on their tour to Ooty. This national park boasts of many wild animals and rich avian fauna along with equally rich flora. It has also been declared as a tiger reserve as it is home to approximately 50 tigers. If interested one can also find accommodation as many guest houses are offered by the Forest Department at different location of the park. A part of Nilgiri Bio reserve, Mukurthi National Park promises a memorable time to everyone amid its enthralling scenic beauty and rich nature. Spread across 80 sq.km, this national park has various streams and rivers flowing through it, which in turn add to the overall attraction of this place. Many animals and birds can be spotted around these sources of water. There are also a few watch towers located inside the national park. It is a popular site for trekking as well. Located about 8 km from Gudalur, Needle Rock view-point presents a mesmerizing 360 view of the surrounding valley and areas. Gudalur is around 51 km from Ooty. Also known as Soochimalai, it is also a popular spot for trekking. This view point got its name as its shape resembles a needle. The view of clouds meeting hills, crossing you as you stand watching them is sure to take your breath away. 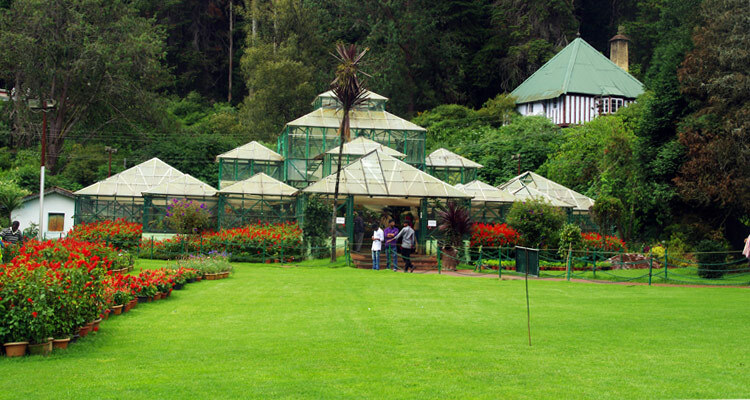 Rose Garden is another popular place to visit in Ooty. Maintained by Government of Tamil Nadu, this garden is spread across 4 hectares of land and proudly presents more than 20 thousand variety of roses. A well maintained garden, it also boasts of winning Garden of Excellence Award for South Asia from the World Federation of Rose Societies. The unparalleled beauty of roses promises a visual treat and an ideal backdrop for photography. A part of Nilgiri Mountain Railway, Ooty Toy Train is a an integral part of every Ooty Tour. It runs from Mettupalayam to Ooty via Coonoor. The ride in this historical toy Train is unmatched to any other train ride; passing through lush green landscapes and breathtaking nilgiri mountains, this train runs on a track of 46 km. There are first class and second class coaches to choose from. Situated around 10 km away from Ooty, Tribal Research Center presents a glimpse into the live of indigenous people. Along with researching into the lives of tribal tribes of SOuth India, it also houses a well stocked library. It also a museum displaying artefacts. Easily accessible by road, this place is an ideal place to understand the lives of local people. As the name suggest Parson valley reservoir is located in Parson valley, which is spread over an area of 200 hectares at an altitude of 2,196 meters above sea level. Situated on the Ooty Mysore road, it can be reached via road. This hydel reservoir can be entered after getting a permission from the forest department. It is the primary source of water to the Nilgiri District. The view of the valley around the reservoir is worth travelling for. Situated on the Ooty Mysore road, this waterfall is around 20 km away from Ooty. Developed as a picnic spot, this place is ideal to come and relax while admiring the scenic beauty of the waterfall and greenery around. There is boat house and a restaurant can be found also near the waterfall, where you can enjoy snacks while the beauty of pristine streams of water mesmerises you. The surrounding area is also popular for Toda settlements. Dating back to 19th century, St. Stephan Church is a place to visit in Ooty for its architectural beauty and religious importance. Although comparatively simpler, this church has beautiful interiors. The painted glass windows along with the painting of Last Supper is especially captivating.It is said that the timber used in the construction of thsi chruch was brought from Srinangapatna as well as from the Tipu Sultan Palace. 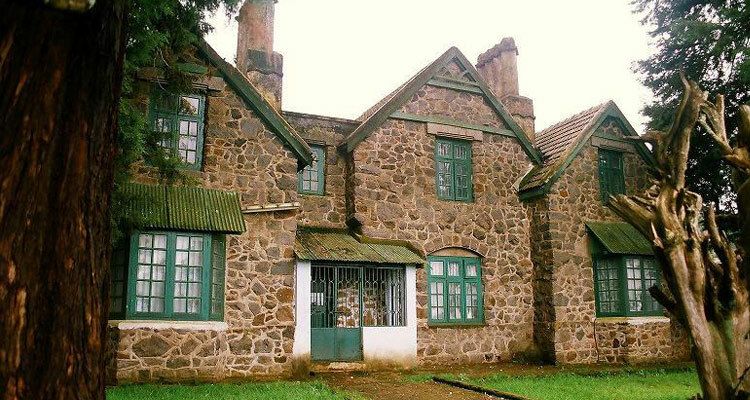 The first bungalow which was built in Ooty is the Stone House. It was constructed by John Sullivan in 1822. Used to be called as Kal Bungalow by the locals, it was built on the land which was brought from the Toda people. Its an ancient architecture is worth seeing. Many tourists visit this place to have a glimpse of this bungalow. 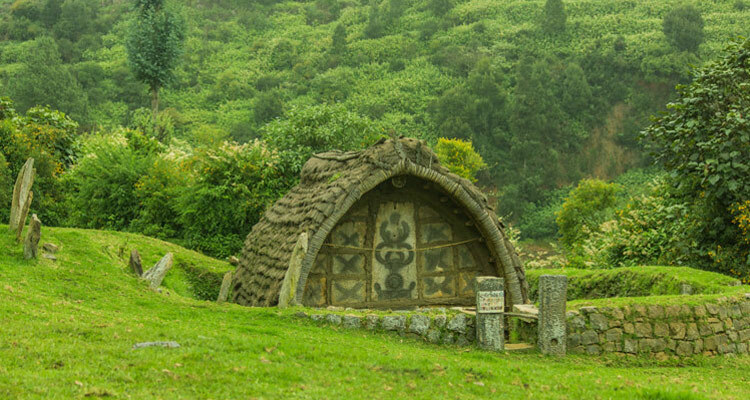 One of the most attractive and unique sightseeing places in Ooty are the Toda Huts. These are the residing place for the Toda people, one of the indigenous tribes of Ooty. The huts are made in the shape of a semi-barrel. These huts don’t have any windows and very low doors where one has to stoop and enter. While once you are inside the hut there is space to stand as well. This close-knit community of Toda people mostly depend on cattle herding and farming for living. Located at a distance of 2 km from center of the town, Wax World is definitely as place to see in Ooty. Many real-like statues of great Indian personalities have been displayed here. Some of the statues at this museum are of Mahatma Gandhi, Bal Gangadhar Tilak, Mother Teresa, Gopal Krishna Gokhale, late Dr.A.P.J. Abdul Kalam and many more. Replica of local people and their living styles has been been displayed here. Over 80 acres of lush green landscapes also housing Hindustan Photo Films Company presents vast spread of greenery and calm environment. A walk here, amid the soothing touch of nature and its calm surroundings with nothing but the sound of birds and leaves hustling as the wind passes by, is something that will make your Ooty tour complete. The sight of sheeps grazing and long stretch of eucalyptus trees is sure to mesmerise you.